Usually Nationals Park is all about the all-American pastime: beer, hot dogs and the occasional Nyjer Morgan temper tantrum. But today, a bit of sophistication joins the lineup. 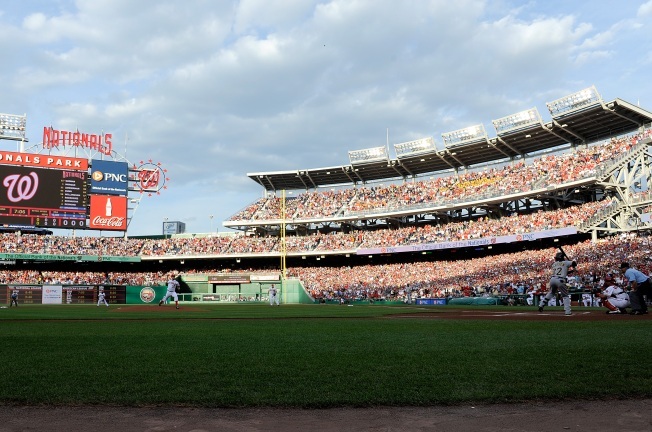 Opera in the Outfield returns for its third annual simulcast at Nats Park. Catch the Washington National Opera and Director Placido Domingo’s performance of Giuseppe Verdi’s "A Masked Ball" on the outfield's Jumbotrons. It’s a casual alternative to the traditional opera experience, where T-shirts and lawn chairs replace the tuxedos and balconies. Seats in the outfield are on a first-come-first-served basis, but seating in a VIP area can be reserved here. And the best part is that it’s free entertainment. You can also expect prize drawings and a family fun zone for the kids. The park planned a "seventh aria stretch" and is announcing the results of a "Take Me Out to the Opera" songwriting contest. Opera in the Outfield started at 2 p.m. on Sunday, with gates opening at noon for picnicking and pre-opera festivities. Up to 20,000 people were expected to attend.